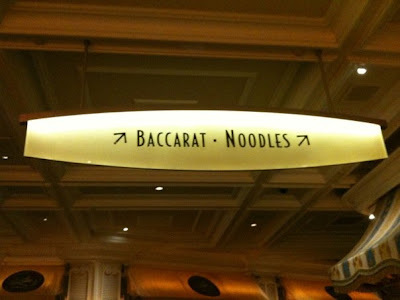 From my friend Karen Chen's Facebook page: "Sign in the Bellagio casino - in case you could not decide whether to eat or gamble!" Or maybe this is just my fantasy casino where instead of playing to win money you play for food. If that dream ever came true it would be do not pass go, straight to the High Stakes Uni Room for me! You can find me at the Candy Slots, using my face as a bucket.